Part of the mission of the Sustainable Construction Centre is to foster the rapid growth of Canada's green economy. Building more awareness of sustainable construction products will help grow the green construction sector. Construction is already one of the largest segments of our Canadian economy. Providing more exposure to Canadian suppliers will encourage innovation and help them develop a stronger foothold in the Canadian market. In turn this will assist Canadian suppliers in reaching larger export markets. 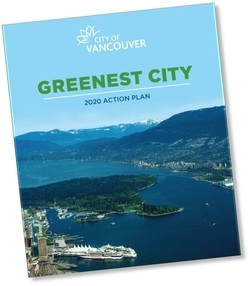 The City of Vancouver has set high goals in its report titled Greenest City 2020 Action Plan. The report highlights the fact that buildings account for 55% of Vancouver's GHG emissions. The Greenest City Action Plan sets the goal of doubling the number of Green jobs by 2020. It is proposed that 50% of these new jobs be created in "Green Building" and 22% in "Clean Technology and Green Building Products". Vancouver's plan therefore calls for 72% of the 10,000 new jobs proposed to be created by 2020 to be the kind of jobs that this Sustainable Construction Centre would build awareness for, showcase and promote. Obviously, other cities in the Metro Vancouver region and the Lower Mainland have set ambitious goals to reduce GHG emissions from residential and commercial buildings. The Sustainable Construction Centre will help the construction industry along in their search for the best solutions to meet municipal goals. The Centre will also help community members navigate through the multitude of options offered to them. The convergence of these goals will result in a great deal of economic activity and rapid growth of the region's Green Economy. This report highlights the fact that BC has the highest adoption rate of "fast-charge" electric vehicle charging stations installed inside and outside buildings compared to other Canadian provinces. The BC government has also set steep GHG reduction targets. 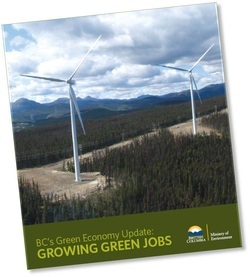 These will only be achieved through wise investments in BC's Green Jobs and Green Economy.